Here’s what’s up in the world of TV for Wednesday, May 24. All times are Eastern. Arrow (The CW, 8 p.m.): It’s not just that the season-five finale is finally bringing the show full circle to its pilot—closing the book on the flashbacks that have played such a fundamental role in this series—that makes this a noteworthy episode. No, it’s the team-ups that are practically Captain America: Civil War-sized in their potential for a fun, exciting showdown. 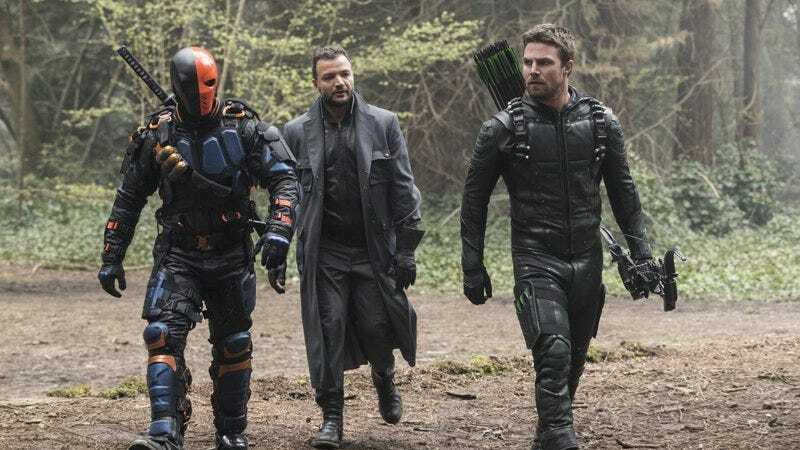 Slade Wilson, Nyssa Al Ghul, Merlyn, and Digger Harkness join Oliver to fight Team Chase (Black Siren, Evelyn Sharp, and Talia Al Ghul)? Bring it. Escape Plan (Bounce, 8 p.m.): Sure, the plot of this 2013 jailbreak flick is thunderously dumb. And yeah, maybe director Mikael Håfström isn’t exactly the world’s greatest helmer of action sequences. But there’s an undeniably goofy sense of fun to this harebrained potboiler, which finds Sylvester Stallone’s high-tech security expert in over his head when he agrees to be imprisoned in a jail he designed in order to test its fallibility. That fun comes in large part from Arnold Schwarzenegger, who hasn’t been this entertaining onscreen since the ’90s. The rapport between the aging action stars is excellent, as is the supporting cast (Jim Caviezel, Vincent D’Onofrio, Vinnie Jones).